Sue Bradley has been involved in advocacy work for people without an effective voice for more than 30 years. She arrived in the Territory in 1970 and worked in Aboriginal affairs and education while raising a family and becoming involved in a number of non-government agencies advocating for the rights of people who were not effectively represented. In April, 2005 she was appointed Foundation Co-Chair of the Statehood Steering Committee, whose role is to present the case for Statehood for the Northern Territory and engage in public consultations on the issue. 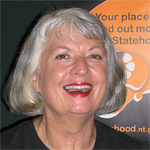 Sue has overseen a number of community consultations, the development of Statehood publications and the imminent release of a community discussion paper on constitutional development (May 2007). In her speech at the Charles Darwin Symposium Securing Territorians Rights: Statehood and a Bill of Rights, she will present an overview of the history of the Territory’s status – from its administration as part of South Australia through to becoming a Commonwealth Territory. Her presentation will examine the current context of Territorians’ rights, looking at the inferior status of the first elected representatives in the Federal Parliament through to the position today. Consideration will also be given to the role Statehood may play in influencing more practical arrangements that will make the Territory a potential leader in a new cooperative federalism.